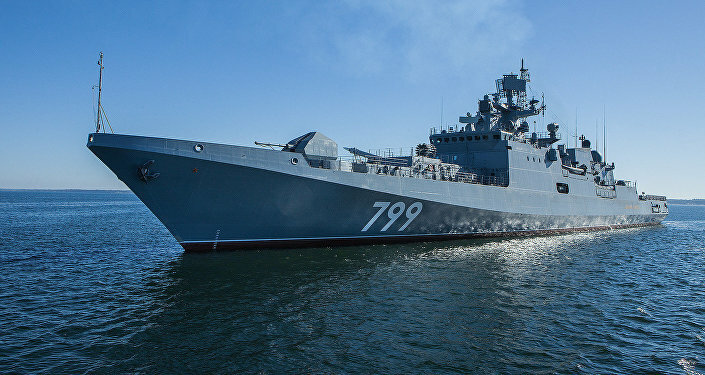 The frigate "Admiral Gorshkov" completed passage of the Malacca and Singapore Straits and has entered the South China Sea, the head of the Sevflot press service, 1st Rank Captain Vadim Serga has stated. "The Russian frigate Admiral Flota Sovetskogo Soyuza Gorshkov, who heads the squadron of warships and support vessels for the Northern Fleet on a long voyage, completed the passage of the Straits of Malacca and Singapore and entered the South China Sea", Serga told reporters. According to Serga, the Russian ship is headed for the Chinese port of Qingdao on the Shandong Peninsula where the 70th anniversary of the naval forces of the People's Liberation Army of China will be celebrated on 23 April. The "Admiral Gorshkov's" crew is preparing to participate in the celebrations dedicated to this date. The frigate is being escorted by the salvage tug "Nikolay Chiker", the "Elbrus" multifunctional material and technical support vessel, and the sea tanker "Kama", he said. 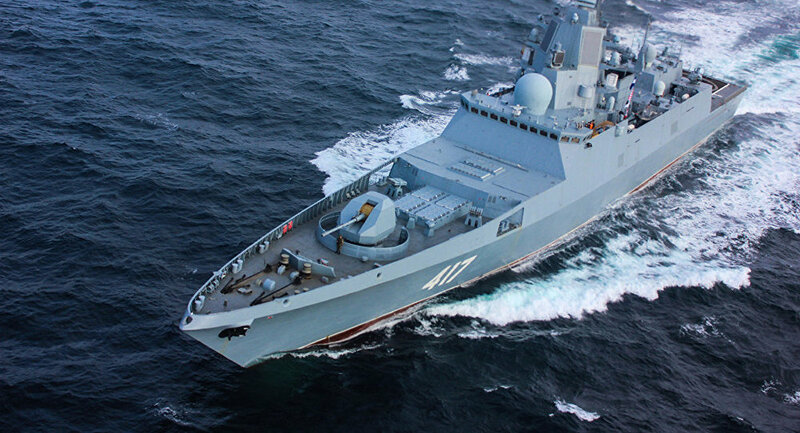 A detachment of ships and vessels from the Sevflot led by the frigate "Admiral Gorshkov" set out on a long voyage on 26 February. For the lead frigate this is the first cruise in its history. The ship's crew made ports of call in Djibouti and Colombo, Sri Lanka. Earlier in the day, Russia's Admiral Vinogradov and Admiral Tributs destroyers, as well as the tanker Irkut, concluded their unofficial visit to the Philippines capital Manila. Russian Pacific Fleet ships have been in Manila since 8 April. "After leaving the port, the ships of the Pacific Fleet and the Navy of the Philippines started drills in the South China Sea, during which joint tactical manoeuvring and communication are being practised", Voskresensky said.